Well, the rumors are true: Gay marriage will ruin the sanctity of straight marriage. Need proof? 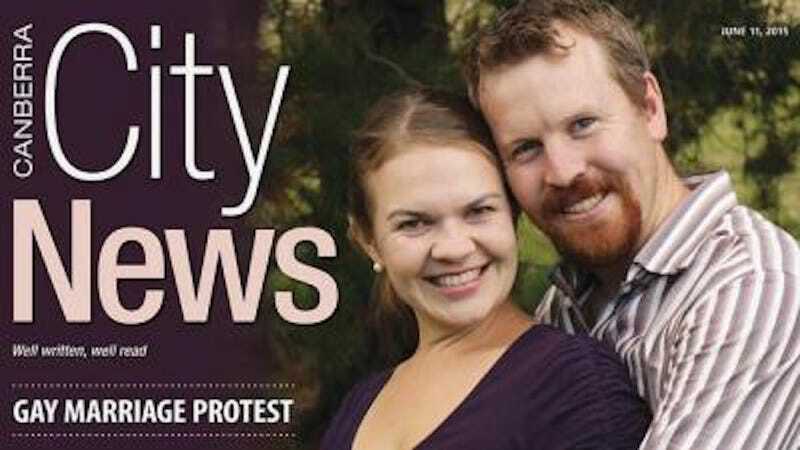 Meet an Australian couple who are threatening to divorce if gays get the right to marry. Nick and Sarah Jensen believe that once those heathen gays can vow everlasting love to each other (and get equal rights), their own marriage becomes null, void and useless in the eyes of God—and thus, their own selves. What? How exactly is this something Christians have to do? Is it so that afterwards, the Jensens and whoever else is dumb enough to do this (Jensen claims he’s in the silent majority, which I do not believe) can whine about how other people being treated equally in the eyes of the law somehow strips them of their rights? That only Christians deserve the right to be married in the eyes of the Lord? If that’s true, why didn’t Jensen file for a divorce when he learned that non-Christians, even atheists, could get married? No one—trust me, no one—is coming for biblical marriage. What homosexuals campaigning for gay marriage are coming for is the ability to feel like citizens with equal rights, something that seems to be even more necessary considering that newspapers are willing to publish garbage like this. Less bigoted, I guess? I see what the editor is saying, but it also doesn’t sound particularly genuine. With sexual minorities working so hard to gain equal rights, is it really that important to publish such a hate-filled view that doesn’t apply to many people? How many others will be emboldened to stand up against gay marriage and threaten to “ruin” their own in the process? My guess? Very few. In case you were worried about how the Jensens’ decision will affect their relationship and their children, the couple has stated that they will divorce legally but not emotionally. So while they’ll happily pull the stunt of getting divorced and blaming homosexuals for their choice (I did not know we had that kind of realultimatepower.net, but apparently we do), they’ll continue living together, loving together, and raising their children together. They’ll also still call each other husband and wife. The only difference is that they’ll do so as single people who have decided to pull a publicity stunt. And let’s be real, now that they’ve got all this attention on them, they’re probably not going to do it at all, choosing instead to discuss how God would never allow them to get divorced and that it would be a sin, and that no matter how hard the gays will work to take down the holy institution of marriage, the Jensens will persevere by continuing to live their lives even though their marriage, because of the gays, means nothing. These people—these people are the real heroes of today.